The Apache is a very controllable long-range straight driver. The Apache (old name, new disc) is a very controllable long-range straight driver. The disc’s wing length is between that of the Sabre™ and that of the Illusion™ at 2.0 cm, with an overall height of 1.3 cm, making it a fast disc with an amazing amount of glide. It has a larger radius where the rim depth meets the flight plate than most drivers in its class, which aids grip comfort for all grip styles. The disc profile is similar to first run Infernos, but with a small bead, giving it much more resistance to turn. The Sure-Grip™ or "S"-Series, is a matted material and is a high end version of the “DX” or “D” plastic of from other companies. This type of polymer offers a firm, solid feel with a grippy surface and great performance in the rain or extreme heat. The "S" plastic allows the disc to break in slowly without changing its flight characteristics after just a few hits. 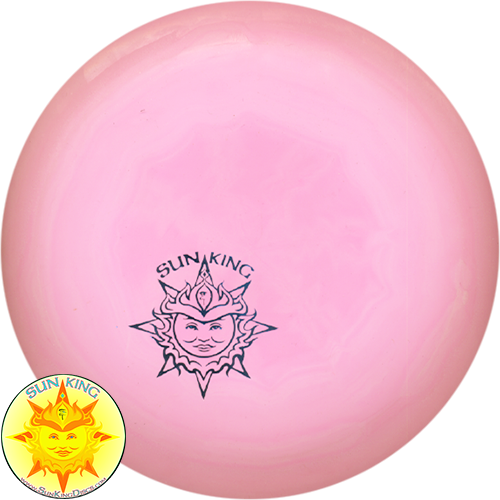 All of these discs feature a mini "Sun King" hotstamp rather than the traditional factory hotstamp.